Redshirt junior Maurice Ways, Jr. announced on Wednesday that he would be seeking a fifth year elsewhere. As a graduate transfer player, he should be eligible to play immediately in 2018. Ways graduated from Detroit (MI) Country Day and caught his passes from quarterback Tyler Wiegers, who has gone on to play for Iowa. Ways initially wanted to concentrate on basketball in high school, but his average height (6’3″) led him to pursuing college opportunities on the gridiron. I gave him a final TTB Rating of 81, because I saw him as a player who would eventually be that big, pro-style receiver that Michigan fans got used to seeing in the 1990s and early 2000s. Unfortunately, he continued to be a little raw – perhaps going back to that early concentration on basketball – and struggled occasionally with drops. Ways appeared to be on the right track in 2015 when he caught 3 passes for 40 yards as a redshirt freshman, and he followed that up with a spring in which he was thought to be headed toward more playing time. Then he suffered a foot injury, which caused him to miss time, and he never really recovered that momentum that he had seen going into 2016. 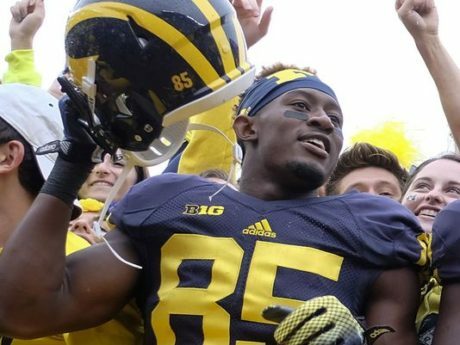 He ended his Michigan career with 6 catches for 47 yards. The Wolverines have a bunch of receivers who have passed Ways for playing time, including Kekoa Crawford, Donovan Peoples-Jones, Tarik Black, and Grant Perry. Ways is a good blocker and reportedly an excellent human being who was involved in a lot of volunteer and leadership activities on campus. He’s a good team and locker room guy, so hopefully he can find a place where he can be a little more successful on the field, too.